Battles with temptation -St Gemma’s heroic chastity and purity. Taken (with adaptations) from “The Life of Saint Gemma Galgani” by Venerable Father Germanus C.P. Whoever wishes to follow Jesus and be perfect must deny self, that is, to renounce all things and take up the Cross, because without the Cross it is impossible to become like Jesus Christ; He who is God Crucified…..Therefore, it is impossible to become one with Jesus without embracing the Cross. Furthermore, in order to become like Jesus and be transformed into a lover of the Cross, man oppressed by sin must subjugate all his wicked appetites of heart and sense. This cannot be effected without doing great violence to self by means of assiduous mortification and self sacrifice. Hence the Divine Mas­ter Himself has said: "....the Kingdom of Heaven," that is the sanctification of the soul- ...the Kingdom of heaven has suffered violence, and men of violence take it by force. ” (Matt 11:12) These words became the rule of Gemma's whole spiritual life. She realized the power of the above doctrine. It moved her to the heroic practice of all the virtues, by the constant thought of Jesus Crucified, and hence her determination to over­come every obstacle to her self-mortification and likeness to Him. Gemma wished to become like Jesus at any cost, having received this ardent desire as a young child while in her mother's arms. It went on increasing until it absorbed all others, and she no longer wished to know of anything else. Hence it was enough to look at her face or movements, or to hear her speak, in order to know that she lived in this one desire: to become like Jesus, to please Him alone. It was then to be expected that this child of grace would set herself to employ every means to the desired end, particularly that of self-mortification. The first thing she gave evidence of in this undertaking was her uninterrupted diligence in bridling her senses. From her infancy she had become mistress of her eyes, and kept them habitually lowered. When traveling to Church for Mass or on errands, she constantly kept her eyes downcast. As she advanced in years and in virtue, she became more firmly established in this practice, owing to a resolution she made, when one day in church she happened to look with curiosity, for a moment, at the dress of a little girl who sat next her. Her guardian Angel immediately showed his displeasure and Gemma resolved never more to turn her eyes to look willfully at anyone in this world. From that day forward those innocent eyes remained closed to exterior things and subject to her will. In order to make her look at you, a formal command was needed. She then obeyed but only for a few seconds and again, modestly blushing, lowered her eyes once again. On this account, whoever desired to observe the beauty of her soul that shone in her eyes was obliged to do so while she was in ecstasy, as then she generally kept them raised to Heaven. One day when rising from the table after dinner, the Devil appeared to Gemma in an impure form and threatened to overcome her at any cost. Gemma turned pale and then immediately ran out the back door to a deep water tank in the back garden. It was winter and the water was icy cold. There and then, making the sign of the Cross, she threw herself in the freezing water and certaintly would have quickly succumbed, had not some invisible hand drew her shivering from the water. Although she was often tempted by the world, the Devil and the flesh, there reigned in the heart of this happy child a joy of paradise that could only be ruf­fled by the fear of offending her Lord, and the thought of His inscrutable judgments. Outside these limits nothing caused her disquietude. And this was quite evident in her exterior, always so bright and affable, and in her perpetual smile, that so strangely contrasted with the dignity of her countenance and the gravity of her bearing. Sin, which contaminates the soul, is the effect of the three great concupiscences that reign in man: pride, sensuality and love of earthly goods. Gemma knew too well how full of contagion the air is that we breathe, and how corrupt the world in which we live. Hence she was always afraid of herself, and, not content with what she had already done in bridling the disorderly appetites of nature, she wished to continue without ceasing the work of her perfection. In this meritorious exercise she gave the first place to the avoidance of dangerous occasions. Clear-sighted though she was, and of accurate judgment, notwithstanding her childlike simplicity, she was able to discern the danger of such occasions at any distance. "Here," she used to say, "Jesus is not to be found; then Gemma, let us fly." Without thinking evil of anyone she normally feared all company, and desired to remain alone, and if it had not been necessary to go out to church and sometimes to the city on errands, she would never have left the house. The same may be said of talking, mixing in the affairs of others, making friends, writing letters and suchlike. She used to say: "Gemma, don't trust yourself; remember that every occasion may be dangerous to you; outside Jesus all is deceit; keep with Him alone and go on with your duties without attending to anything else." Yet the most beautiful fruit that Gemma gathered from the tree of the Cross and from mortification was chastity. Adorable virtue, how rare thou art in this depraved world! And yet thou should be the dowry of every Christian soul, whose vocation according to the words of the Apostle is to be holy and immaculate. Our angelic Gemma learned how precious was purity while yet a child from her saintly Mother, and as from those first moments she began to love her Jesus she became aware of this priceless jewel and strove with all her energy to keep it untarnished in her soul. Among the practices to this end suggested by her solicitous mother, one was to recite devoutly every evening while kneeling on her hands under her knees, three Hail Marys to the Queen of Heaven in honor of her Immaculate Conception. The innocent child, though knowing so little at that early age, took keenly to this devotion and never omitted it. Rising from this prayer and joining her little hands she added these words: "Blessed Mother, never allow me to lose holy purity. Place me under your mantle, guard this treasure for me, and I shall become more pleasing to Jesus." A few days before her death, finding herself alone, although she had lost all strength and could not stand, she rose, and taken by surprise by a visitor, was found kneeling with her hands beneath her knees, reciting her usual 3 Hail Mary’s for purity. As she advanced in years, her love of the angelic virtue of purity and her desire to preserve it without spot grew with her. This was a special object of her mortifications, penances and the custody of her senses. It seemed to her that any liberty, however innocent and insignificant it may be, might discolor this beautiful flower, and so as to avoid this she took every precaution. She never went near a mirror, not even to do her hair or wipe away the stains of blood that flowed from her forehead when crowned with mystic thorns, or to wipe the blood from her eyes during her dolorous contemplation. And when during impulses of Divine love, her heart took fire and burned the corresponding exterior part of her skin, and when by a dart of fire from the side of Jesus Crucified she felt a large wound open in her side; and when her heart itself by its mysterious throbbings greatly distorted and curved three of her ribs, although ignoring at first what such phenomena meant, she refrained from looking at or touching herself, and never did so on the frequent renewal of these various wonders. We have seen already that from her earliest childhood she shrank from being touched by others, and from the most innocent caresses. In her childhood, she endeavored not even to allow her father to kiss her. When she lay on her deathbed and of her own accord she asked for Extreme Unction (Sacrament of the Sick -editor), great was her consternation at the thought of having to get her feet washed by someone elses hands. What was to be done? Her love of holy modesty gave her strength, and seizing on the first moment that she found herself alone, she put out her hand, took the basin, water and towel, and did all for herself; then full of joy, to those who came to do her the needful service she was able to say: "Thank you, but I don't need help; I have done all by myself." "I never wanted to obey when they wished a doctor to visit me (for I never wanted anyone to touch me or see me.) One evening a doctor came unannounced, examined me by force and found an abscess on my body which he feared was very serious because he thought it had affected my spine.For a long time I had felt pain in that part of my body but I did not want to touch or look at it because when I was a little girl I had heard a priest say: "Our body is the temple of the Holy Spirit." Those words had struck me and led me to guard my body as closely as possible. After he had visited me the doctor called a consultant. What affliction it caused me, dear Father, to have to uncover myself. Every time the doctor touched me I cried. After the consultation I grew steadily worse and I was forced to go to bed and was not able to move. Every remedy was used on me but instead of helping me they made me worse. While I was in bed I was ill at ease and a source of annoyance to all.The second day I was in bed I was not at peace and I wrote to Monsignor telling him that I wanted to see him. He came at once and I made a general confession, not indeed because I was so bad off but to regain peace of conscience which I had lost. After confession my peace with Jesus returned and as a sign of this, on that same evening I experienced a very deep sorrow for my sins.Then, dear Father, the pain became worse and worse and the doctors decided to operate on me (in that part of which I have spoken). Three doctors came (and what I suffered from the pain was as nothing). I felt pain and suffering only when I found myself in their presence almost entirely unclothed. Dear Father, how much better it would have been for me to die! Finally the doctors saw that all remedies were useless and they gave me up entirely. After that they came to see me only now and then through courtesy, so to speak." "Meanwhile the Friday occurrences continued and Monsignor thought it well to have a doctor visit me during one of them without my knowing it. But Jesus warned me saying: "Tell your confessor that in the presence of the doctor I will do none of the things that he desires." Following the advice of Jesus I told my confessor about this but he did as he had planned, and events turned out as Jesus had said, as you already know." “Please do not repeat the mistake of calling in the doctor. What would a doctor understand? He would say, 'Hysteria, hysteria' and that is all, and perhaps along with that a stupid laugh directed to­ward those who believe in the supernatural. And this ridicule the Catholic doc­tors know how to make even better that the unbelievers and freemasons. Therefore, absolutely no doctors! Tell Monsignor this in my name." Father Germanus also wrote several letters to Monsignor Volpi, respectfully making the same request. The angelic purity of Gemma's soul was reflected in her body, which in many ways presented quite unusual qualities. You would have said it was formed of some crystalline material. Although her body was neglected by her, it was resplendent in its exquisite regularity- not even during the trying maladies and illnesses that confined her to bed for such a long time did her body ever emit the least unpleasant exhalation. Some marvelled at hearing of this, and to satisfy their curiosity proved it by visiting her often, and remaining near her night and day. More than that, on several occasions those near her remarked how her person and also what she touched exhaled a delicious fragrance that certainly was not of this earth, since Gemma did not use unguents or perfumes, or even soap for washing except when necessary. Moreover, that grateful fragrance came quite unex­pectedly and moved all to devotion. "Don't you perceive a fragrance?" said the bystanders one to another. "Our dear Gemma! Assuredly Jesus, or the heavenly Mother, or her Guardian Angel is here with her." Of course, such a fact is not new in Christian hagiology; nay, it is told of many Saints, for example St. Paul of the Cross and St. Mary Magdalene of Pazzi, whose body even now, three hundred years since her death, diffuses a delicious perfume. "Oh Father, what terrible temptations these are! All temptations are painful, but these against holy purity torment me the most! What I undergo is known only to Jesus, who secretly guards me and"-note the sense of this ex­pression-"He is pleased with me." In order to avoid seeing those representations, the poor child, not knowing what else to do, used to shut her eyes and keep them so until the angel of impurity had gone. She also seized her Crucifix, called for aid to her dear Guardian Angel, to her patron Saints and above all to her Heav­enly Mother. By these means, after long hours of fighting, being left free, she returned immediately to her soul's peace, and full of joy exclaimed: "Let us thank Jesus, that today also things have passed in the way most pleasing to Him." But Gemma was not satisfied with this. Having learned that the Saints in order to repress similar temptations had resort to scourg­es, hair shirts, plunging into frozen water, etc., and believing that she ought to imitate those servants of God, she made up her mind to do so. And so earnestly did she set about it, that if obedience had not interposed, she would have cut her innocent body into bits. But, for all that, so great at times was her fear of being led in those horrible moments to offend against purity and chastity, that she lost sight of all else, even of the necessity to ask her confessor for permission, she took to the lash, the hair shirt; the knotted cord with sharp points, with which she tightly girt herself; and at times the pain of those sharp points penetrating her flesh caused her to faint. Now, in the face of such heroic examples, ought we not blush? -We who professing to follow Jesus Christ in the ways of sanctity, yet show ourselves so tender towards our bodies, and so adverse to curbing its unruly appetities. Has not our Divine Saviour said- “…the kingdom of heaven has suffered violence, and men of violence take it by force. ” (Matt 11:12). I think I read something about St. Gemma not wanting to go to doctors who wanted to examine her stigmata in her biography. If you are aware of that passage could you post it? Yes, that is an excellent suggestion. In her great purity and modesty Gemma did not want her person to be seen by physicians or anyone else. I just added a section to the article above to address this. The new section above is called "Her aversion to medical examinations"
I'm wondering, when Jesus told St. Gemma that he will not work any stigmatas when the doctors examine her, was He saying that medical examinations at the cost of modesty are immoral? Thanks for pointing out the typo error. I fixed it. You asked "I'm wondering, when Jesus told St. Gemma that he will not work any stigmatas when the doctors examine her, was He saying that medical examinations at the cost of modesty are immoral?" Gemma's spiritual director, Venerable Father Germano wrote to Gemma's confessor, Mons. Giovanni Volpi several times about this, and Mons. Volpi wrote back at least one time. The copies of these letters are in the book "Portrait of St Gemma -A Stigmatic". Rev Germano felt that Gemma's extraordinary gifts should NOT be subject to examintation by outsiders, because firstly they would not understand or appreciate such extraordinary graces, and secondly it would be a danger to Gemma's humility and chastity. Monsignor Volpi felt that Gemma should be examined by a few of his trusted advisers, at least one Priest and one Physician, of his choosing. Jesus, for His part, stated to Gemma in an ecstacy that Monsignor Volpi was welcome to examine His gifts that He gave to Gemma all that he wished, but if he sent doctors or other Priests, He (Jesus) would withdraw His exterior graces from Gemma, and they would see nothing. And this is exactly what happened. The Priest and Physician viited Gemma and they saw nothing. They found a sewing needle on the floor in Gemma's room, and they came to the erroneous conclusion that Gemma used that to create the stigmata upon herself. And so, it was not just Gemma's purity that Father Germanus (and Jesus) sought to protect, but also her humility. It was also a matter of keeping the "King's secrets" secret, so to speak, and revealing them only to those who would appreciate them. This is such a marvelous testimonial for today's young people. To pray for purity is a practice long since forgotten, unfortunately. Thank you for spreading information and devotion to St. Gemma, so more people can discover her great sense and love for purity and modesty. Your comment is very well said! May the young Saints who were models of purity intercede for all the youth of today! May St Gemma Galgani, St Maria Goretti, St Gabriel Possenti and St Therese of Lisieux pray for us, and inpire the youth of today to protect and covet their chastity and purity! Thanks Glenn for your mention of purity of heart, which is so rare to hear these days. With regard to help with chastity and purity, you might be interested in the Angelic Warfare Confraternity, which involves the intercession of St. Thomas Aquinas. It has been around for several hundred years and is experiencing the beginning of a resurgence. Just Google it and you'll probably be directed to the lay Dominican community in New Hope, Kentucky -- they have some materials. 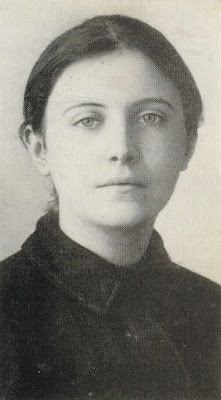 St Gemma went to be with God on Holy Saturday, April 11, 1903. Since then, from her place in heaven she has helped and interceeded for countless people who have called upon her, and asked for her heavenly assistance. Being so closely united with God, she can obtain for us many graces and blessings, if only we ask her to. Best wishes and may God bless you and yours. 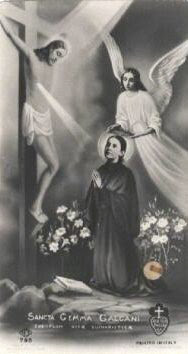 St Gemma Galgani is an inspiration to all. I wish that the people of this earth could try to be more like her. Her story is so beautiful, angelic and pure. Our world is corrupted with lust and war, if there were more people like her in this world than it would be a much better place. Reading this comforts me a lot, knowing that whenever she could Gemma wouldn't allow the doctors to examine her...ever since I was little I've also hated it and never allowed a male doctor to examine me, and when I had to once I cried until I was almost sick. In fact, the last doctor I saw (a woman doctor) basically had an attitude of "you get what you deserve" towards my feminine health problems because I refuse to have a pelvic examination, and when I tried to explain, she said "well I'm Catholic too, are you saying pregnant women can't be examined?" as if that was somehow relevant or as if I'd made any comment about what others should do! She told me I was making myself suffer unnecessarily and that "God doesn't want us to suffer!" and so forth, it was just appalling...(sp)...Even though someone has a right to refuse doctors act as if you've violated THEIR rights when you won't give consent to something you don't believe in! I hope dear St. Gemma will pray for me that with all my health problems which doctors can't or won't help me with at all will go away so I won't be subjected to the ill-treatment of so-called "professionals" anymore!